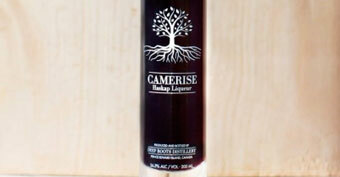 Camerise liqueur from Deep Roots Distillery has finally arrived on shelves at the Charlottetown Farmers market! We’ve had a chance to taste this delicious liqueur during our open house/field-day and it is something very unique, refreshing, and worthwhile picking up if you haven’t already. The liqueur is made from the haskap berry currently in production here at Phytocultures that has both a tangy and sweet flavour which pair with alcohol really well. The original announcement from Deep Roots Distillery: “We are happy to introduce Camerise. This Haskap Liqueur is finally dressed and ready to hit the shelves. Displayed in a tall sleek bottle with a transparent label we can’t be more excited to share this with all of you. Come find us at the Charlottetown Farmer’s Market to pick up a bottle”. With plans to hit store shelves soon.